How do you best treat a puncture wound and how do these differ from lacerations and other types of injuries? What do you need to be aware of and watch for if you suffer one of these injuries? Puncture wounds and lacerations can look the same at the surface of the skin. It's really the depth below the surface and what internal organs or tissues are damaged that matters most. Puncture wounds can be deep or shallow and large or small. Treatment depends on the severity of the puncture wound, and the size and speed of the object creating it. Also, treatment is different based on whether the object that created the puncture is still in the body or was removed. An object that is sticking out of the skin is called an impaled object. A bullet wound is a type of puncture wound created at high speed and often leaves the object still under the surface. Animal bites can also be in the form of a puncture wound and bring with them the additional complication of potential infection. For all puncture wounds, bleeding control and infection are the priorities. If you encounter a person with a puncture wound the first step is to protect yourself. Stay safe. If you are not the victim, practice universal precautions and wear personal protective equipment if available. Once you determine that you are safe to be near the victim, and after you have protected yourself with gloves and eyewear protection if indicated, follow these steps. Control bleeding before anything else. Putting pressure directly on the puncture wound while holding it at a level above the heart (if possible) for 15 minutes should be enough to stop bleeding. If not, try using pressure points. Pressure points are areas where blood vessels lie close to the surface of the skin and include the brachial artery (between the shoulder and elbow), the femoral artery (in the groin along the bikini line), and the popliteal artery (behind the knee). Tourniquets should be avoided unless medical care will be delayed for several hours. Know when to call 911. Call 911 right away for puncture wounds of any depth in the neck or if a deep puncture wound (or one of unknown depth) occurs to the abdomen, back, pelvis, thigh, or chest. 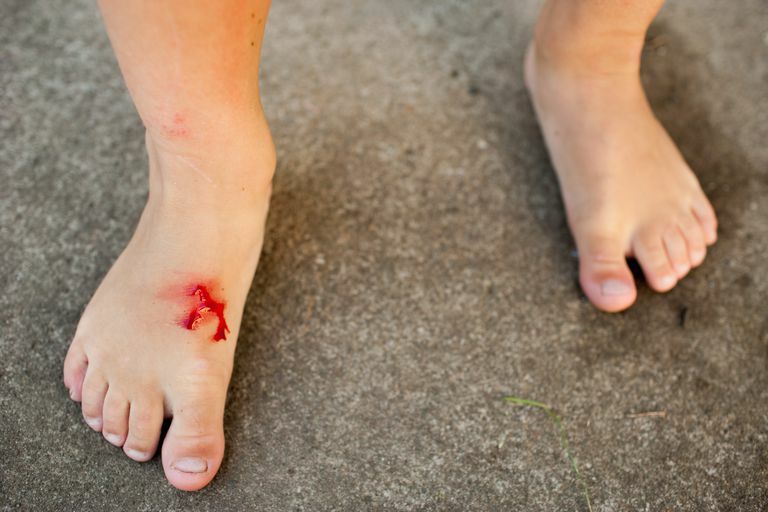 Puncture wounds in other regions, even if shallow, should prompt you to call 911 if the bleeding will not stop. Holes in the chest can lead to collapsed lungs. Deep puncture wounds to the chest should be immediately sealed by hand or with a dressing that does not allow air to flow. Victims may complain of shortness of breath. If the victim gets worse after sealing the chest puncture wound, unseal it. When bleeding is controlled, wash the wound. Once bleeding has been controlled, wash the puncture wound with warm water and mild soap (see illustration). If bleeding starts again, repeat step two. Properly dress the wound. For smaller puncture wounds that do not require stitches, use antiseptic ointment and cover with adhesive bandages. Watch for signs of infection. When you change the bandages, or if the victim develops a fever, chills, or is feeling poorly, check for signs of infection. Increased redness, swelling, or drainage, especially pus-like drainage is a sign that you should contact a doctor. If redness begins to radiate or streak away from the puncture wound, contact your doctor right away. Clean and change bandages daily. Clean and change the dressings (bandages) over a puncture wound daily. Each time you change the dressing you should clean the wound and look for signs of infection. Give pain relief if needed. Use acetaminophen or ibuprofen for pain relief as needed as long as there are no reasons why these should not be used (such as kidney disease). If the puncture wound is contaminated, the victim should consult a doctor as soon as possible for a tetanus vaccination or booster shot. Wounds of the feet, those that cannot be cleaned right away, and wounds made by animals all carry a high risk of contamination. Puncture wounds caused by animal bites may also cause rabies. Rabies is a preventable disease but is almost always fatal if you wait until symptoms are present. Always consult a doctor for wounds caused by animal bites. Human bite wounds carry a very high incidence of infection, much more than bites such as dog bites. Always seek out medical care for a human bite wound. Gunshot wounds are unpredictable and can be much more serious than they appear at first glance. Always call 911 as soon as you are in a safe position to do so. The chance of a person surviving a bullet wound is related to how long it takes to get emergency medical care. Apply the principles of a puncture wound care above but if the wound is above the chest, do not elevate the victim's legs as this can increase bleeding. Puncture wounds differ from lacerations in a few ways. Sometimes it can be uncertain whether an object is still present within the wound and it also very hard to tell the depth of the wound at first glance. With a puncture wound to the chest, back, or pelvis, it's best to call 911 if the puncture is deep or you can't tell the depth. With a neck wound call 911 regardless of the depth. Basic first aid strategies for controlling bleeding and knowing when to all 911 or seek medical attention are discussed above. If you are taking care of someone who has received a puncture wound make sure to practice universal precautions and practice safety for yourself first. An injured rescuer does little to help an injured a victim and can result in two victims. Puncture wounds should be monitored closely. If there is a risk of rabies, vaccinations should be done right away as waiting for symptoms is usually fatal. Bite wounds of any form often become infected and medical care should be sought out for any of these.